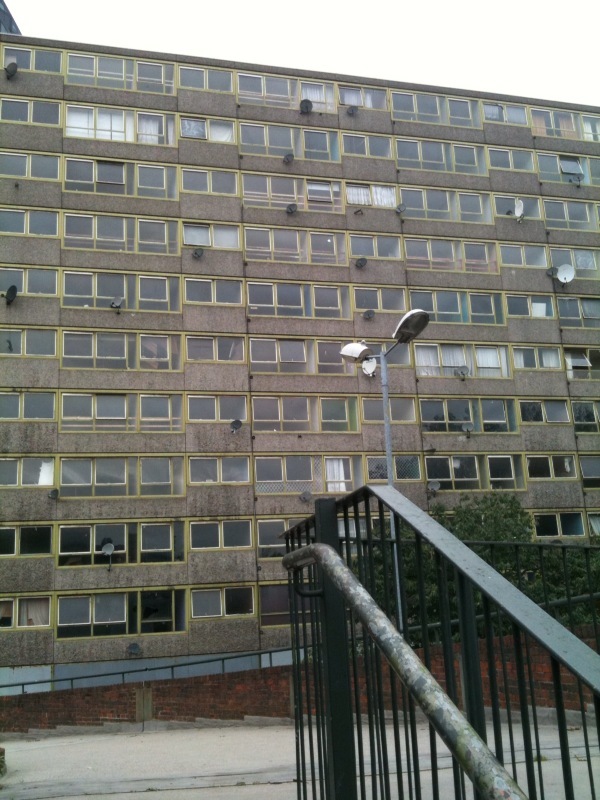 Recently, I went up to Elephant & Castle to record some urban atmoses on the notorious Heygate Estate. I think I was expecting to get nice slap-echoed shouts and bangs, dog barks – the stereotypical ‘estate’ sounds you always hear. However, the estate was actually completely dead. Most of the buidlings are to be demolished as part of a larger regeneration programme in Elephant & Castle, so nearly all the residents have now been moved out. 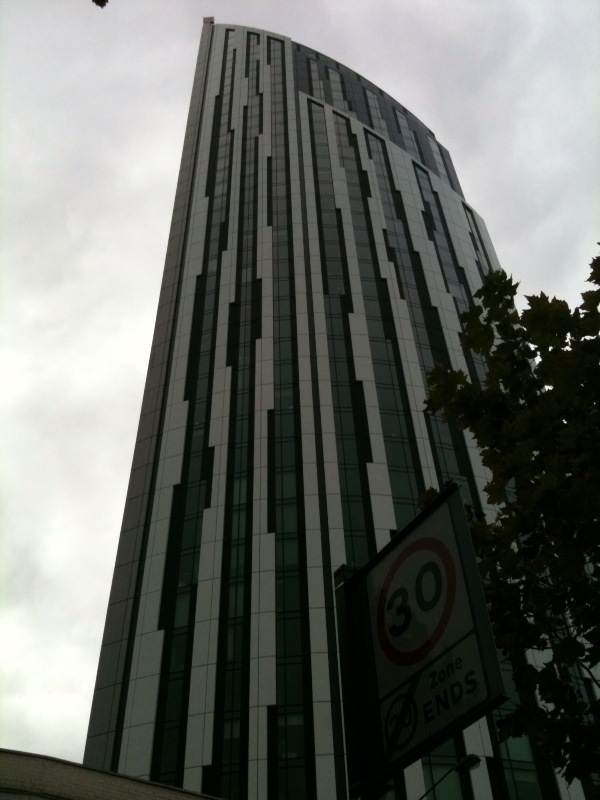 Initially disappointed, I soon realised that this afforded me the opportunity to get some really clean ‘skylines’ because the high-rise blocks gave me shelter from directly hearing the very busy main roads. Usually you have to go high, i.e. to the roof of a building to get the necessary distance from traffic, voices and passing footsteps in order to get a good skyline atmos ‘bed’ (to lay your FX on top of) but I found the enclosing walls of a desolate high-rise estate to be equally effective. However, I’m sure you’ve all heard urban skylines before so instead I thought I’d share one of the outtakes of my recording trip with you all. As per usual, in any busy environment, there’s always a few who want to stop and ask you if you work for the BBC or something (I just say yes now) and the Elephant & Castle did not disappoint. Normally, the inquisitors are fairly wild-eyed if not just downright scary but on this occasion I actually had a policewoman (amongst others) stop and ask me what I was doing. To start with I thought she was going to ask me to move along or something but she did just genuinely seem up for a chat. Now, in some ways I feel a bit bad, as though it’s perhaps underhand, that I’m publishing this conversation on my blog but on the other hand I was standing pointing a bloody great fluffy Rycote in the air when she came over and started talking to me so I don’t think this can really be considered ‘stealth’ recording as such. Apologies if the content of the recording seems a bit boring. It’s not so much what we’re discussing that interests me; I’m not sure what interests me about it to be honest. Maybe it’s just that us sound editors spend so much time trying to separate the real world into nice clean layers that we can reconstruct and mould into an onscreen ‘reality’, that it seems odd when every once in a while you end up recording a slice of life without even trying. Just to round off my trip, at Elephant tube station on the way home a young couple with a kid in a pushchair got into a row with an older lady in the lift going down to the trains. Shockingly, the argument culminated in the older lady hitting the kid in the pram and, not surprisingly, the young mum screaming at her and basically trying to throttle her. Didn’t stick around to record that slice of life.